From top afternoon tea venues in stylish thoroughfares to artisan tea houses in cosmopolitan corners, flower tea is floating its way into the hearts of afternoon tea fans. A luxurious indulgence boasting the wow factor, we simply had to try it for ourselves. 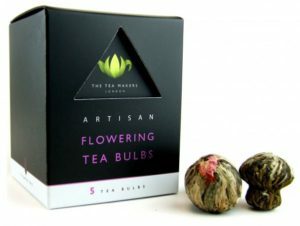 A quick look on-line brought us to theteamakers.co.uk where we selected a box of their artisan flowering tea bulbs. Perfectly packaged our tea arrived in a chic tea gift box. Each bulb was individually sealed meaning that they were pristinely fresh upon opening. These artisan flower teas from The Tea Makers are meticulously hand crafted in China. 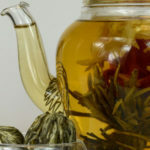 Each tight bundle of flowering tea consists of the highest grade of dried silver needle green tea leaves which are wrapped around one or more dried flowers. 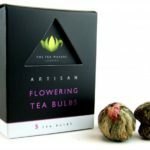 Popular flowers used in the making of flowering tea include chrysanthemum, jasmine, lily, hibiscus osmanthus and rose bud. Which will flower will be in your tea? Placed in a clear glass teapot with boiling water (no point in hiding their beauty in a china pot), the flower tea bulbs gently unfurl in a few short minutes to emulate a flowering bloom with the flower revealed as an equisite centrepiece. A sight to behold, this was bewitching to watch. A joy to the senses, the freshly brewed pot of flower tea has a gentle fragrance with a hint of sweetness. A smooth taste, this delightful tea was very light and refreshing – perfect for a hot, sunny afternoon. A great talking point, flower tea would be a colourful highlight for any afternoon tea party. 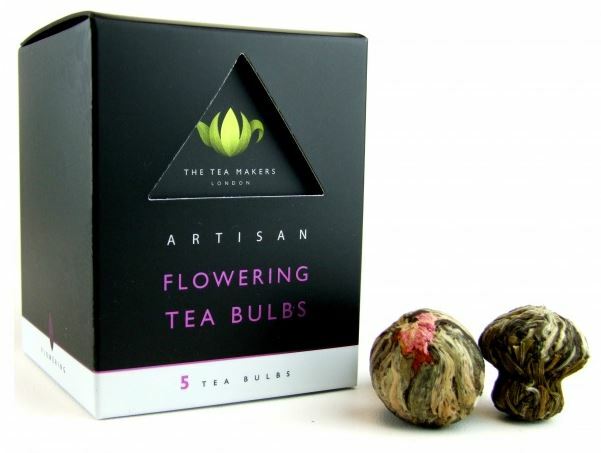 Our taster pack of 5 tea bulbs is available from The Tea Makers for £7.95. We had our own glass tea pot but The Tea Makers have a great glass teapot selection offering a variety of designs starting from £13.80. We think this would be a fabulous gift for any tea lover.